Are these bearded ‘giants’ being held captive by their genetics? My study focuses on elucidating whether these majestic birds are suffering the consequences of reduced genetic variation in comparison to their forefathers. We have unwittingly bestowed upon the Bearded Vulture Gypaetus barbatus a notorious name. Lammergeier, which means “lamb-vulture”, is the title the species has, and continues to hold as they were thought to be the chief killer of farmers’ precious lambs. This idea, as well as many superstitious traditional beliefs, has added to the incorrect perception and persecution of these endangered birds. The persecution of vultures generally comes through poisoning (both directly and indirectly), the muthi trade, and collisions with powerlines and infrastructure. Additionally, their persistence is threatened by a declining food supply, reduced availability of nesting sites and the encroachment of human-settlement. 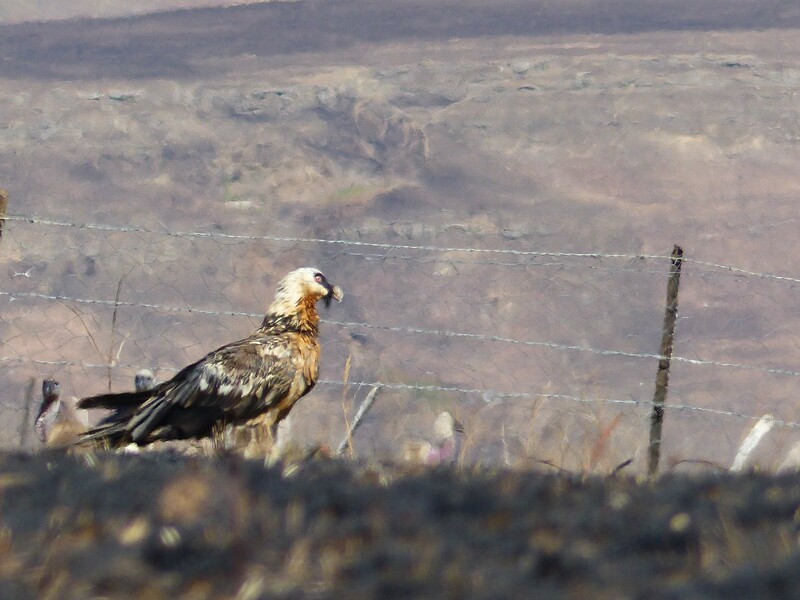 Unlike many other raptor species, climate change does not seem to be a predominant factor affecting Bearded Vulture survival. Perhaps its reputation, as well as our ignorance, has also added to the lack of conservation efforts focused on this vulture. However, vultures are receiving more attention as we realize the crucial role they play in healthy ecosystems. Vultures are vital in removing and disposing of carcasses and decaying matter which have the potential to harbour a plethora of bacteria and viruses that pose serious threats to human and livestock health. Vultures thus play an important role in reducing the potential for disease spread and ‘spillover’ in healthy ecosystems. As a consequence of this, their immune system has become well adapted to dealing with a high toxic load, higher than any other known bird. Studies of their immunology (a hot topic) may reveal insights into disease and disease tolerance. I am currently working on my master’s degree under the supervision of Dr Sandi Willows-Munro and Dr Sonja Krueger at the University of KwaZulu-Natal (UKZN). This project has given me the amazing opportunity of working on these paradoxically beautiful vultures. Why the Beardeds pose such a peculiar and puzzling study species is because they are sparsely distributed across an extremely large range. Albeit severely reduced, populations are found in Europe, Asia and Africa. Of particular interest to me is that there is an isolated population in the Drakensberg mountain range of South Africa. In my project I will examine the genetic diversity of the South African population using microsatellite loci. We will also be including samples from Europe and Asia so that we can examine the connectivity of the isolated South African population to other populations of Bearded Vultures. Besides looking at the genetic variation in current South African and European populations, historical samples from museum records are also being analysed to ascertain whether the low diversity observed in the species is due to 21st century persecution, or whether it is perhaps a relic of their evolutionary history. This has given me opportunities to interact with institutions, and to work towards a common goal. Thus far, my study has taken me on a steep learning curve from the genetics laboratory to the field in search of these spectacular birds. To experience both these extremes reminds me daily why I chose the project and why South Africa is an incredible country to be conducting research in. I completed a BSc majoring in biology and genetics, an Honours degree in Ecology and I am currently immersed in my MSc degree at the University of KwaZulu-Natal, Pietermaritzburg, all in pursuit of my passion. Great article, Melanie! Though, I doubt there are many people from outside SA that know what the Muthi trade is without making a guess. Surprisingly, the Bearded Vulture was the first vulture species I encountered in South Africa, when I went on a raptor-ringing weekend with Dr. Shane MacPherson. We saw two Beardeds that day! They are probably one of the most attractive vulture species, though I will argue that the King Vulture of South America can compete with them. I look forward to hearing your results. Keep up the good work! What a coincident- a Bearded up at Pennwarn, Drakensberg was the first vulture I saw too. As the saying goes, “Beauty is in the eye of the beholder.”.